Created in 1989 under the honorary presidency of Prof. Théodore MONOD, Pro Anima is a scientific committee composed of researchers, academics and medical doctors, all volunteers. Even though significant funds are invested in research, some major pathologies such as cancer and neurodegenerative diseases (Alzheimer, Parkinson, MS, etc.) continue to progress. Pro Anima identifies the use of animals for experiments as a leading source of shortcomings in our public healthcare system and provides proof that no species can be considered a reliable biological model for another, a species being mainly defined by its reproductive isolation. Thus, experimentation on animals is not only useless, it can be dangerous for humans, leading each year to the premature death of large numbers of people. Pro Anima undertakes the verification and promotion of reliable, modern, quick and inexpensive biological methods, in particular to test the toxicity of various phytosanitary and industrial products which are part of our daily lives (pesticides, additives, colouring agents, food preservatives, etc.). Pro Anima has also coordinated a new toxicology technique – “VALITOX” – as a contribution to meeting the requirements of the EU REACH Directive, that requires the testing or retesting of some 100,000 chemical products (45,000, according to industrialists). Pro Anima also organises and participates in international colloquia, conferences and debates in order to foster synergies between the latest scientific discoveries and has created a citizens’ platform to raise funds to support research without animals. promising ways forward. 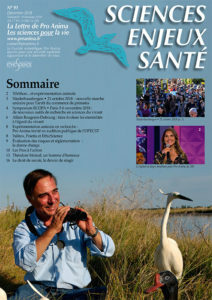 Pro Anima publishes and distributes a quarterly Bulletin “Sciences, Enjeux, Santé” (Sciences, Challenges and Health) to promote its causes and actions.